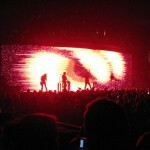 On Tuesday November 11th 2008, Nine Inch Nails descended upon Ottawa and brought their long awaited Lights In The Sky tour to the nation capital’s masses. 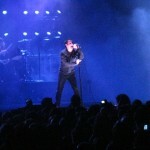 For almost 2 and a half hours, Trent Reznor and his touring band laid down a visual and auditory assault on 6000 fans. Ottawa fans had waited a long time for Nine Inch Nails to come to Ottawa. Originally scheduled to play their first ever Ottawa concert in 2006, Trent Reznor had to cancel that show due to having come down with a very bad cold a few days earlier in Quebec City. More than 13,000 tickets had been sold before that announcement was made. Wanting to quench my Nine Inch Nails thirst, that summer I made the treck to Toronto to catch their With Teeth tour. This time around, it was just a quick jaunt across the city. The show started very early for a concert. The opening band Boris, a Japanese alternative band, took the stage at 7:15pm and gave a strong opening show. The music very much suited the Nine Inch Nails style and the crowd who was there to see the show. The only drawback to this band was not that they don’t sing in english (they sing in Japanese), but that you could hardly hear the vocals over the instruments. Regardless, I was impressed by their music and will check out the local record stores to see if I can find one of their CDs. Boris played until 8pm, 45 minutes being longer than most opening acts play. It was only 8:35pm by the time Trent Reznor, Robin Finck (Guitar), Justin Meldal-Johnson (bass), Josh Freese (drums) and Alessandro Cortini (keyboards) took the stage. From the very beginning, NiN fans were treated to an exciting, energetic, visually impressive show, the likes that Ottawa has never seen before (at least no concert that I’ve been to in this city). Even though the show was not even close to being sold out, the band played with as much energy and gusto as if they were playing in front of a crowd of 50,000 people. The show opened with newer songs like 1,000,000, Letting You, Discipline and Head Down before playing older songs such as Closer, Head Like A Hole and Wish. The concert slowed down significantly when surprisingly they played some songs from Ghosts I-IV. All in all, I believe every album release was covered during the 135 minutes of the show. 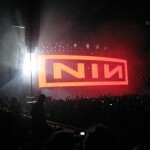 On the 2006 With Teeth tour, Nine Inch Nails fans were introduced to the transparent digital screen. Growing that concept, the Lights in the Sky tour boasts 3 massive transparent screens with motion sensors and an amazing light set that creates the most visually electrifying stage show that I have ever seen. Moving around the stage for various songs, these screens and lights echoed perfectly the style and mood of the songs being played. During Only, the screen was covered in static, with the screen melting away as Reznor stepped close to it, which is very reminiscent of the video for the song. One has to wonder how Reznor will top this stage show on his next tour. My only complaint about this show was the crowd. This was one of the very few concerts where I witnessed entire sections just sitting through the entire show. Attempting to stand up would result in being asked to sit down. Depending on the song, the crowd went from just being there to jumping and moshing. On a scale of 0 to 10, sometimes it was a 0, sometimes a 9. One has to hope that the lower than expected turnout and the partially dead crowd won’t stop Nine Inch Nails from coming back to the Nation’s Capital in the future. All in all, ignore the crowd, I have to give this concert a 9 out of 10. My pictures of the show. Videos of the show (Not my own as I didn’t make any at this show).